Jimmy Doohan, George Takei, Bernie Koppel, and an over-the-top cameo from Randy Quaid. How can you go wrong? Well the answer is, you can't. This nature-gone-mad tale centers on meat-eating cockroaches that invade a small resort town, driving mad the locals they don't kill outright. Scotty's the town sheriff, Sulu is an etymologist and Siegfried plays the proprietor of the local hotel whose daughter has a recurring nightmare about being devoured by bugs. Doesn't help her mental state when Daddy is one of the creepy-crawlies' first victims. Most mutant-creature films focus on how the humans will kill the nasties, but this one also addresses how the cockroaches came to be, putting a bit of an environmentalist twist on the gore. There also seems to be something else behind the roaches' sudden appearance, something - or someone, perhaps - nefarious. Are the deadly roaches the tools of some dark power? Greed gone mad? Or are they just creatures that kill in really cool ways? 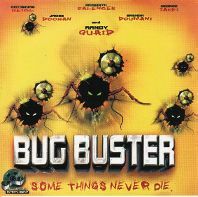 You'll have to watch the film to find out, of course, but I can tell you that Bug Buster successfully walks that fine line between dark humor and camp, providing chills and surprises along with not-a-few belly laughs. And Randy Quaid as the marginally-mad exterminator named the General who is called in by the surviving townspeople to subdue the insect hordes is not to be missed. Think of his crazed abductee in Independence Day, crank the crazy up to 11, and you'll have some idea of his turn in this film. Definitely worth the price of rental. Bug Buster harkens back to the day when being a B picture wasn't an excuse for poor quality. The special effects are great, the storyline has enough twists so that you don't see the end coming about five minutes in, and the mix of newer faces and veterans in the cast makes for an enjoyable 93 minutes. You ain't getting Shakespeare here, but then you won't need to put out a call for Joel and the bots, either.